Public demands to remove garbage dumps from the vicinity of homes on grounds of health risk are posing a huge problem for local bodies who say they have no legitimate dumping grounds as alternatives. 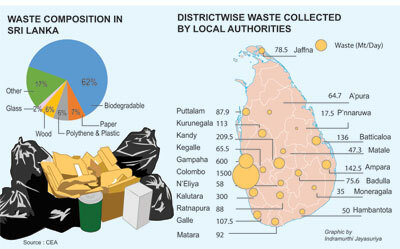 Central Environment Authority (CEA) Environmental Pollution Control Director Ajith Wijesundera said there was only one sanitary landfill in the Dompe Pradeshiya Sabha (PS) and that the country needed at least 24 sanitary landfills, one for every district. For now, garbage is dumped illegally in open state and privately-owned land. With no proper procedure followed, local authorities are facing litigation from private landowners who want their plots returned. The Western Province generates around 3500metric tons (MT) of solid waste a day of which only 2400 MT is collected. Of this, approximately 15 per cent is turned into compost, 10 per cent recycled and 75 per cent thrown into open dumps. Janatha Vimukthi Peramuna (JVP) organiser for Kandy district Gayan Janaka said garbage from the area was being dumped in open land in the Akurana, Kundasale and Minipe PS divisions. He said two weeks ago, around 50 families from Alawathugoda, Akurana had protested, demanding that the garbage dump close to their homes be removed. In the Kundasale PS, toilet affluent collected in gullies is being dumped in the Digana town, belonging to the Wildlife Department. The Mahaweli Ganga runs along the site. The Minipe PS is dumping garbage into the sports grounds of the Ranasinghe Premadasa National School. The primary school is only 50m away and the Yoda Elle runs 10m from the dumping grounds. Complaints have been ignored by the authorities. The recent floods have also compounded the situation with the mountainous garbage dumps washing into homes in the Ambaluwewakanda area. Twenty-five displaced families continue to live in the Gnana Siripura School in the Gampola town as they cannot yet return to their homes. The residents of Badulla face similar problems. JVP PS member Samantha Vidyaratna said garbage is being dumped in the Vincent Dias national sports ground, used by schoolchildren. A hundred meters from here is the Badulu Oya, and the garbage seeps into the lake. The water is used for drinking, bathing and cultivation. Protests by residents have fallen on deaf ears. Attempts by the Badulla Municipal Commission to run a plant to compost the waste have failed. In Welimada PS, garbage is being dumped near the Kiriuthurana Wewa. The polluted water in the stream is being used for bathing and cultivation. In Matale themunicipal council was dumping garbage near the Diyapahala Oya where about 5,000 families live, JVP Organiser Gamgedera Dissanayake said. The mounting garbage gets washed into the Diyapahala Elle, posing a health hazard to around 150 families living 100m away from the dump. Several protests carried out by residents are been ignored. “The residents have to swat away flies with one hand while they eat; the authorities don’t even attempt to cover the site with a layer of sand,” Mr. Dissanayake said. A recycling company that was started had to be closed down due to lack of support from the municipal council. In Pahalpathwela in the Matale PS, garbage is dumped in a cemetery. Three weeks ago, 200 residents carried out a protest. The police then banned the PS from dumping in the area. Now, abandoned tractors full of garbage are seen parked at the site. The residents are continuing to protest. 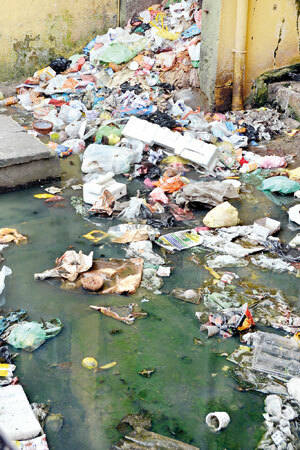 The garbage from the Dambulla Economic Centre is actually costing lives. The putrid vegetables and fruits dumped in the Digampathha area on the Polonnaruwa-Hingurakgoda A9 highway, is drawing wild elephants into the area. Daily, around 12 lorry loads are dumped here. Wild elephants are seen feasting along these roads even during the day, posing danger to residents and tourists. Residents said four people had been killed by wild elephants in the area. Waste management experts argue that lack of awareness and education among the public and the local authorities is causing the problem. There is insufficient capital investment to carry out an effective waste management strategy, they say. The experts also point to a reluctance in creating and implementing laws and the lack of political commitment at all levels of government. There is also said to be an absence of accountability in service delivery and poor technical know-how. The Director of Waste Management in the Western Province, Nalin Manaperuma, said deterrent laws gazetted by the Western Province authority on waste management in 2008 are still to be implemented. Proposals to introduce a system of volume based service charge and spot fines on polluters had to be shelved as the local authorities lacked infrastructure to collect and dispose of waste. An extraordinary gazette no. 1560/6 was passed on 30 July 2008 giving legal support to the rules for spot fines of Rs. 500-5,000 or court-imposed fees of Rs. 5,000-50,000 or jail terms of a minimum three months and not less than one year to polluters in the Western Province. This was shelved due to the local authorities’ lack of capacity to implement the system. “There is a dire need for more tractors and land to function efficiently and our efforts for increased allocations in the annual budgets has failed. Last year, we asked for Rs. 500 million but received only Rs. 65 million. The previous year also we received the same,” Mr. Manaperuma said. He said the WP was now aiming generate income by introducing polluter-pay programmes. The WP authority will soon be implementing a volume-based bag system providing households with different sizes of bags for perishable, recyclable and mixed waste. Households will be encouraged to sort out their garbage and will be charged if the garbage is not sorted out. A 20-litre bag of mixed garbage will cost Rs. 40 for collection. A pilot project started in Boralesgamuwa is in operation and plans are in place to extend the programme in other areas. In parallel, several community-based programmes for waste reduction are being carried out. Mr. Manaperuma said pilot projects for recycling glass, plastic and paper are functioning in Colombo, Gampaha and Kalutara and around 25 compost plants, each with a capacity to process 260 metric tons a day, have been given to local authorities. Citizens are also been asked to participate in the reduction process by sorting out and reusing waste. It is estimated that in 2050 the waste collected in the Western Province will reach 6000MT per day. “We have to be prepared,” Mr. Manaperuma said. “The people will have to take responsibility in managing the waste. We are trying to introduce community-based programmes for waste reduction using the 3R concept – reduce, reuse and recycle. We are conducting awareness among residents to segregate glass, plastic and paper when disposing,” he said. The Pivithuru Pura (green village) – small community-based programme – aimed at minimising waste management and separation of waste is been done at household level. In addition, infrastructure of local authorities in waste collection and waste transportation is being built. It is planned to extend the Pivithuru Pura concept to the entire 400 Grama Sevaka Niladhari divisions of the Western Province. In an Open-Controlled Dump (OCD) at Thombawila, Karadiyana only solid waste is dumped and can be turned into energy. Dumps at Kaduwela (600MT), Horana (100MT) and Ambalammulla (350MT) have been identified as future OCDs. The Western Province’s aim is to reduce 85 per cent of the waste in open dumps to 25 per cent by 2020, Mr. Manaperuma said. It is planned to recycle 12 per cent, turn 7 per cent into compost and incinerate 47 per cent. Although composting will be profitable the Western Province has constraints on available land. Currently, 8 per cent of rubbish made into compost, 7 per cent recycled and 1 per cent incinerated. “This is a national problem going on for the last 15 years. There is no complete solution to this. It is easy to point a finger but we need a collective approach to solve this problem. There is a scarcity of land and wherever we go there are mass protests from people forbidding us from using those sites. “We hope to find solutions to the problem over the next 12 months. We plan to reduce the number of dumping grounds and to separate waste at the collection point to degradable and non-degradable. The collected garbage will be composted or recycled and only the residual waste will be dumped in the sanitary landfills.